The political campaign season has already begun despite there being over nine months left before the 2014 midterm elections. Nerdwallet has taken the campaign contribution data from the Center for Responsive Politics and ranked the 50 largest US metropolitan areas in terms of political contributions. San Jose came in at #4. 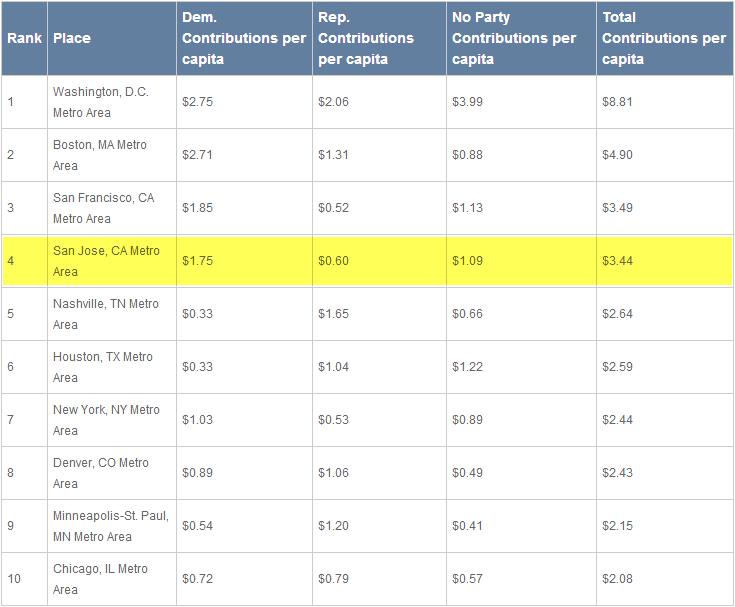 I have to say that I am a little bit surprised to see San Jose rank so high on the list, but am not surprised to see that 75% of party-specific contributions went towards the Democratic Party. Check out the full article and more analytics at the source link below.